The Yoga for Runners Workshop (two hours in length) is open to all levels of runners (beginners to elite) and yoga practitioners (no experience to advanced). The workshop includes a vinyasa-style yoga practice beginning with a dynamic sequence (designed to be performed pre-run as a warm-up) and moves seamlessly into sun salutations that link strength-building exercises and yoga poses targeting muscle groups specific to running. The physical portion of the workshop ends with a relaxing, cooling flow accompanied by longer-held poses aimed at releasing connective tissue and common tight areas in the body due to running. The workshop incorporates myo-fascial release exercises using foam rollers and therapy tools. Guided meditation and breath work (pranayama) designed to enhance running performance is interwoven throughout the practice. Participants will receive electronic copies of the workshop's running resources via email post-workshop and must bring their own foam roller and yoga mat. 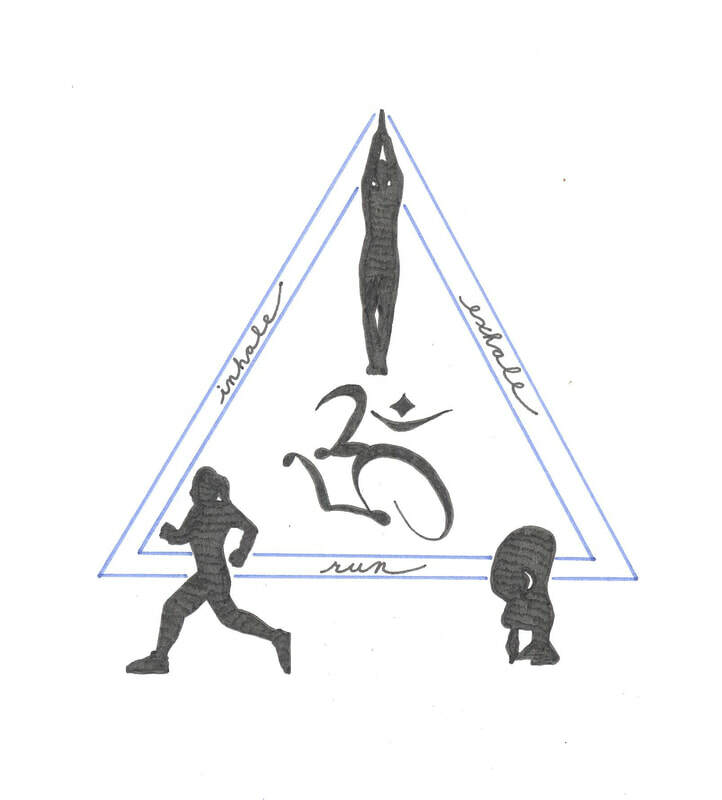 The purpose of the workshop is to create a mind/body/spirit connection with running using yoga as a conduit and breathing as the primary guiding element so that running becomes a lifelong, easy, enjoyable, rhythmic practice, with yoga at it's core. Suitable for run/walkers, hikers, cyclists, snowboarders and skiers. Leah Staley, LMT & RYT, and Brynn Cunningham, RYT-200, both avid runners and yogis, bring you a unique Yoga for Runners experience, now including a Foot Massage! Beginning with a vinyasa-style yoga practice and dynamic sequence (designed to be performed pre-run as a warm-up), class will move seamlessly into sun salutations that link strength-building exercises and yoga poses targeting muscle groups specific to running. The physical portion of the workshop ends with a relaxing, cooling yin yoga and restorative-inspired flow accompanied by longer-held poses aimed at releasing connective tissue and common tight areas in the body due to running, using props such as bolsters, blocks and blankets. During the 20-30 minute cool-down, Leah Staley, LMT, will provide a therapeutic foot massage for each participant. The workshop incorporates myo-fascial release exercises using foam rollers and therapy tools. Guided meditation and breath work (pranayama) designed to enhance running performance is interwoven throughout the practice. Participants will receive electronic copies of the workshop's running resources via email post-workshop and must bring their own foam roller. Open to all levels of runners (beginners to elite) and yoga practitioners (no experience to advanced). The purpose of the workshop is to create a mind/body/spirit connection with running using yoga as a conduit and breathing as the primary guiding element so that running becomes a lifelong, easy, enjoyable, rhythmic practice, with yoga at it's core. Warm up at the studio with a dynamic yoga sequence, run 30 minutes (at your own pace) around Uniontown and cool down with yoga in the studio. No yoga experience required. Participants must be able to run for 30 complete minutes prior to this event. Brynn, Leah and Tara will act as your guides for the group. With the arrival of spring, our bodies yearn to get active in the outdoors. Join Brynn Cunningham of Inhale Exhale Run, LLC, for a class designed for runners, walkers and those who enjoy the run/walk method. Warm up at the studio with a dynamic yoga sequence, learn how to apply yoga philosophy to your walking/running routine and then walk, run or do a combination of both for 30 minutes on a dirt path at your own pace around our neighboring Chalk Hill Lake. Cool down with yoga at the studio. No yoga or running experience required. Aerobic activity pairs with strengthening, lengthening and yoga principles for a mindful, breath-centered fitness routine. Join Brynn and Leah Staley, runner, yoga instructor and licensed massage therapist, for an an exclusive event just for runners. Luxuriate in therapeutic restorative and yin yoga postures supported by bolsters, pillows, blankets and other props while receiving the healing touch of sports massage, targeting muscles and connective tissue for optimal mobility, tension release and recovery. Special attention will be given to hips, legs, feet and shoulders. No yoga experience necessary. Simply relax and let go to rejuvenate and set the tone for your next run or race. This workshop includes physical therapy techniques including a self-assessment body check, prescribed self-healing exercises and one-on-one diagnosis of physical imbalances. Participants will take home a work book with their prescribed, specific exercises to restore mobility in the joints and functional health in the muscles and connective tissue.